One may love Prime Minister Narendra Modi or hate him. But none can ignore the growing global clout of Modi. This was highly visible in the countries he has his footprints. The latest one being, United States of America which denied visa to him for more than 13 years in the past and demonized him for the violation of religious freedom. Today the scene in U.S is totally opposite to that was two years ago. The joint session of US Congress which Prime Minister Narendra Modi addressed was a testimony to the changed attitude of US towards the Indian leader. In his 45 minutes speech, senators and representatives gave standing ovations ten times. For every point he made, there were rounds of loud applause. This was not just a customary visit of a head of a nation but it was the most powerful visits and highly motivating speech which captured the hearts of American Congressmen and women. There are many social media and WhatsApp jokes about the foreign visits of PM Modi. Many of these jokes ask why to spend more than Rs.400 crores to visit 35 countries? When the Prime Minister visits other nations, he is at best capable of bringing huge foreign capital, technology, expertise and other positive aspects. Overtly he garners support for India’s battle against terrorism. Covertly he increases the image of India with other nations. With the continuous efforts of India, today Pakistan has been exposed of its dubious deals with terrorists. The state sponsored terrorism from the soil of Pakistan has been given a death blow through the intense efforts of India. Slowly USA is getting to know what India has been saying for ages – stop aiding Pakistan which is nurturing terrorists on its soil against the humanity. Now USA has decreased its aid to Pakistan for grooming merchants of death inside its territory. Either Pakistan has to mend its way or to fend its status only with few friends like China. Those who are criticizing Prime Minister for his frequent foreign visits are ignorant of the fact that sitting idle at home does not make a good Prime Minister. In these two years of Modi’s government the Foreign Direct Investment (FDI) has grown 48%. Several catchy programmes like Digital India, Make in India, Smart City, Swachh Bharat Abhiyan, Skill India, Start Up India etc are attracting eyeballs around the world. The biggest worry is that these programmes should not end up as mere slogans and paper tigers. Strengthening the safety and security of India and Indians is the prime aim of Prime Minister’s foreign visits. In these visits, he gathers world opinion against the supporters and patrons of terrorists. By exposing the evil effects of terrorism, Modi seeks to isolate those nations which have been hosting the terror elements in their soils. He wants to break the backbone of the coalition which is hell-bend on disrupting the peace and tranquility of genuinely growing nations like India. He has successfully sold the solutions to the world nations. Now they are buying the medicines from Modi for their cure in advance. From Africa to America, from Europe to Australia, from Arabia to Iran, Modi has tirelessly toured to make them to understand that terrorism is a global danger. By seeking the world support, he is increasing the strength of India in the battle against terrorism. While this has been the motive initially now he has turned his mission towards securing the global hand for India’s membership in the Nuclear Supplier’s Group (NSG) and Missile Technology Control Regime (MTCR). This is almost done due to his untiring efforts and visits. These are not simple gains but will enhance the social development in remarkable ways. 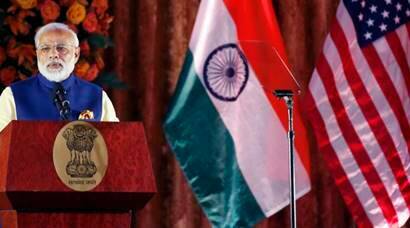 In his next effort, India may enter United Nation’s Security Council as the permanent member. The world sees Narendra Modi as its powerful leader who is capable of motivating them by giving them due credits. He is able to strike cordial and warm personal bonds with even adverse nations like China and Pakistan. The personal rapport which he has developed with almost all world leaders including that of hostile nations tell the tallness of his global statesmanship. Cutting across party, religious, regional, caste, community differences, Indians must support Prime Minister Narendra Modi’s efforts to secure India its due place in the world level. It is not about Modi’s growth but it is India’s growth and growth of all Indians.